↑ "UC Annual Endowment Report, Fiscal Year Ended June 30, 2012; p.4" (PDF). Office of the Treasurer of the Regents of the University of California. สืบค้นเมื่อ 2013-01-07. ↑ 2.0 2.1 "UC Berkeley Enrollment Data". University of California, Berkeley. สืบค้นเมื่อ July 29, 2012. ↑ "History of UC Berkeley". University of California, Berkeley. Archived from the original on February 7, 2011. 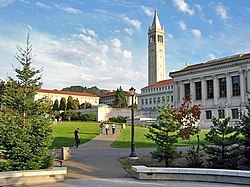 Founded in the wake of the gold rush by leaders of the newly established 31st state, the University of California's flagship campus at Berkeley has become one of the preeminent universities in the world. ↑ Maclay, Kathleen (2010-09-28). "Two young faculty members named MacArthur "genius" fellows". Newscenter.berkeley.edu. สืบค้นเมื่อ 2012-06-08. ↑ "Chemical Elements Discovered at Lawrence Berkeley National Laboratory". Lbl.gov. June 7, 1999. สืบค้นเมื่อ February 21, 2011. หน้านี้แก้ไขล่าสุดเมื่อวันที่ 12 พฤศจิกายน 2556 เวลา 01:40 น.